With the magic of the Thar desert as its backdrop and a spectacular azure shaded landscape, Jodhpur is one of India’s most regal cities. The second largest city in Rajasthan, Jodhpur is part of a region known as the House of Marwar and is also famous for Polo, giving the traditional riding attire its name. There is plenty to see and do in Jodhpur, whether you’re just stopping by on your way to the desert or planning on exploring for several days. 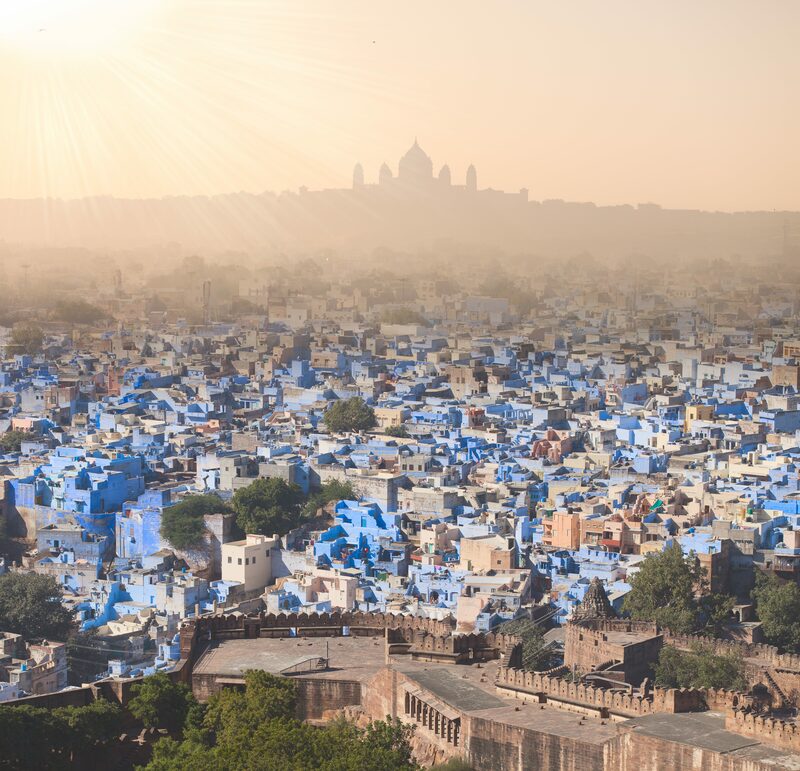 Known as the Blue City, legend has it that Brahmins first started painting their houses blue to show their high place in Jodhpur society. 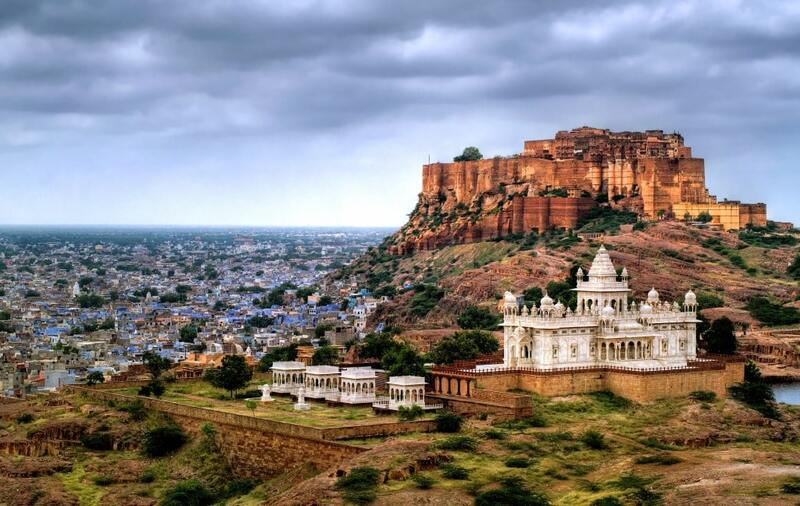 Soon everyone else followed creating a spectacular view from the Mehrangarh Fort of the desert turning blue. For a picture perfect view of the stunning blue houses, head to the canons that are on the ramparts of the fort. If there’s only one thing that you see in Jodhpur it has to be the Mehrangarh Fort that towers over the city. One of the largest forts in India, it was built in 1459 and still stands strong today. The walls of the fort stretch over 10 kilometres with seven gates that all lead a path into this majestic fort. As new Maharajas inhabited these hallowed walls they each added their own touch with new palaces and gates. Jai Pol, also known as the Gate of Victory, was built by the Maharaja Man Singh in 1806 to celebrate his victory over the great armies of Bikaner and Jaipur. The main entrance to the fort is through the Fateh Pol which was built in 1707 after Maharaja Ajit Singh defeated the Mughals. The Moti Mahal or Pearl Palace was built at the turn of the 17th century and is where the royal throne of Jodhpur stands. The Palace of Flowers was built over a hundred years later and as you would expect from its name, is quite a beautiful building adorned in gold. There is also a Hall of Mirrors and the Sheesh Mahal that has large stained glass windows and interesting inlay work. While the Mehrangarh Fort is the heart of Jodhpur, the white marble cenotaphs of Jaswant Thada nearby are also imposing. Built in 1899 for Maharaja Jaswant Singh II, four generations of rulers have been laid to rest here. South East of the fort is the Umaid Bhawan Palace which is a modern palace built in the 20th century. It was actually started by the King as a way to provide employment to townspeople during the depression but soon became one of the largest private homes in the world. It’s still home to royalty and a part of it has been converted into luxury hotel Umaid Bhawan Palace that houses vintage cars from the royal collection. Wherever you look in Jodhpur the people are dressed in stunning clothes. Women wear fabulous wide skirts decorated with mirrors, bright colors and adorned in amazing jewellery. Not to be outdone, the men wear jewel colored turbans and some sport impressive handlebar mustaches. 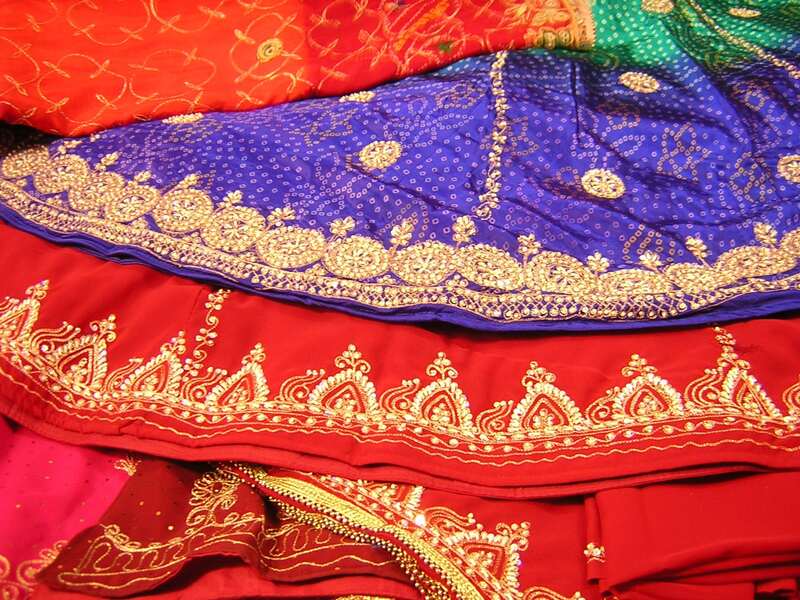 Jodhpur is also one of the best places in Rajasthan to pick up exquisite handicrafts. From Afghan carpets to leather work, marble inlay and tie-dyed textiles in all the colors of the rainbow. The best place to hunt for bargains is the Sadar Bazaar, just don’t forget to bargain hard. There’s certainly nothing subtle or under-stated about Jodhpur, the city is everything you imagine Rajasthan to be. There’s music, dance, colour and joy, which makes Jodhpur such an enjoyable city to visit.